By the time you read this, I will be putting the finishing touches on my fourth semester of Grad school. I’m very excited since I get the next two months off, though those will be packed with activities as I prepare to move across the ocean. Also! Since the last time we talked, one very important development has arisen. TCM launched its own app and website called Watch TCM which streams the channel online. That in and of itself would be great, but they also keep many titles available for streaming for days afterward. There’s a catch, naturally– you have to be a TCM subscriber (or be a good friend of one like me 😉 ) to access the content. You can get a longer and more detailed rundown over at Cinematically Insane. In less classic film related news and more general ‘me’ stuff, I contributed to Forgotten Filmz’ annual Crush Blog-A-Thon. My piece, on 2001’s perennially underrated Josie and the Pussycats and the perennially beautiful Rachael Leigh Cook, popped up today. Back to pre-Code stuff! (I should have organized this better, I apologize.) During some down time this month, I updated the Wikipedia List of Pre-Code Movies page with the newly listed titles; it’s grown by quite a bit since I created the page, and while I don’t agree with some of the movies being on there (Thirty Day Princess? Really? ), I’ll still plan to cover all of them at some point in the future. I’ve also sketched a few more expansions to the site that you may be seeing over the next few months. But for now, I hope you and yours have a wonderfully wintery holiday season! I’ve found over the last few years in writing these reviews that I like more movies than I find indifferent and am indifferent to far more movies than I dislike. This month will actually mess with that trend: three movies in December rated a ‘Dislike’ from me, so prepare for some grumpiness. However, as part of a December blog-a-thon in cooperation with CMBA, I will actually be discussing my favorite film of all time, one that is an essential pre-Code, an essential comedy, and an essential film all around. And just to make the holidays go down smoother, two pre-Code entries from a legendary dance team who’re still on our lips today. I chuckled a bit when I read over your little mention of Josie and the Pussycats – I used to LOVE that film when I was younger! You’re right, I DO think it’s underrated. I watch it every few years and it’s just a lot of fun. The fact that Rachael Leigh Cook is super cute doesn’t hurt either. 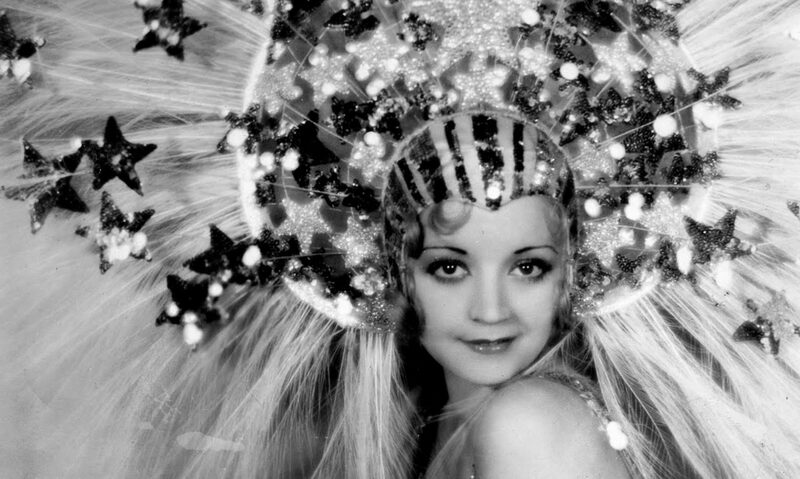 Please identify the film (if the still is indeed from a film) in which Mae West appears in this butterfly outfit. Thanks. Belle of the Nineties (1934)! I’ve had this argument with someone before, but… “The Gay Divorcee” was filmed in the summer of ’34 and released in OCTOBER. We all know the Code was enforced on July 1st of ’34, so even though I’m sure the screenplay was written before the enforcement, isn’t it technically not a Pre-Code film when it was released well after the Code had started? Technically, no, and I probably wouldn’t cover it if it weren’t in the Wikipedia list. There’s still some risque stuff in it, but compared to, say, Flying Down to Rio, it really isn’t in the same league. When I review it (did I spoil that I’m hitting in the next few weeks?) I definitely point out how much you can tell the difference from something truly pre-Code and something coming out after the enforcement. Well, I could have meant the eternally beloved duo of Ruby Keeler and whoever Ruby Keeler is dancing with… but, uh, yeah, probably not. Late thanks for the link!